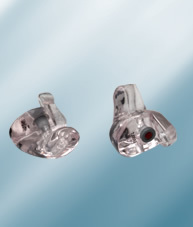 The Compact is the only ELACIN custom-made hearing protector made in hard acrylic. The ELACIN Compact is a real boon for those who work in the automobile industry, but also for people with a narrow auditory canal or those who are allergic to silicone. The user is fully protected against loud noises. The grip makes it easy to insert and remove.Supplied with a cord and a shirt clip.With a choice of 4 filters: the ML01, MM02, MM22 and MM12, depending on the intensity and length of the exposure to noise.